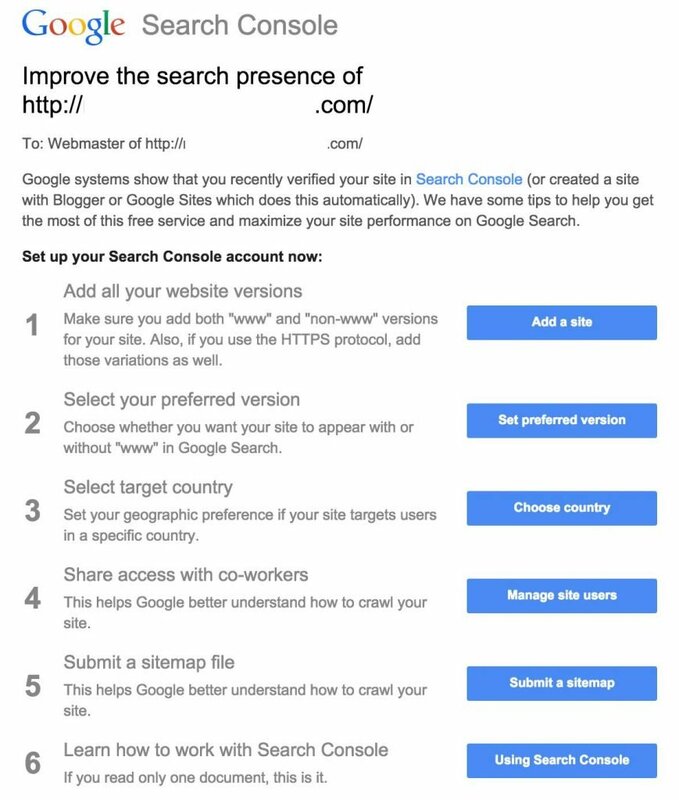 When you add a website to Google Search Console (GSC) (formerly Google Webmaster Tools, GWT), you get an email with subject “Improve the search presence of [URL]”, where URL is the URL of the site you just added. I included a screenshot of the email below. This email includes 6 steps to setting up your site in GSC. If you’ve never done it before, it may be a bit confusing, so let’s walk through it. As the email says, “We have some tips to help you get the most of this free service and maximize your site performance on Google Search.” Below are the steps and explanations straight from the email, with my comments. I also recorded a video that walks through each step. Unless the steps say otherwise, you should do these for the preferred version of your site. For example, if http://domain.com is your preferred version, submit the sitemap for that version of your site. Note: if you didn’t receive this email after adding your site to GSC, check your messages in GSC. If you already have Google Analytics on your site, it’s an easy way to verify. I recommend without www because it’s shorter and looks cleaner. But, if there’s a reason you need or want www, pick that. You only need to do this for one version of your site, and it will apply to all of them. See Set your preferred domain (www or non-www). If your site is a US-based business serving US customers, you should select United States. If you’re targeting another country, select it. If you don’t want to target, don’t set this. On the left-hand menu, click Search Traffic to expand the Search Traffic menu. On the International Targeting report, click the Country tab. Check the Geographic target checkbox and choose your country target. If you want to ensure that your site is not associated with any particular country or region, select Unlisted in the drop-down list. You can easily share access to your site in GSC with anyone who has a Google account (co-worker or not). Be careful about permissions; use the principle of least privilege (grant only the permissions they truly need, not more). Access to each version of your site (www and non-www, https) is controlled separately; granting access to version doesn’t apply to others. Click the gear icon , and then click Users & Site Owners. Type the email address of the user you want to add, and select the permission level you want. You’ll first need to know the URL of your sitemap. If you use Yoast SEO for WordPress, as we do for clients, then you’ll use sitemap_index.xml. You only need to submit a sitemap for the preferred version of your site. On the left-hand menu, click Crawl to expand the Crawl menu, and then click Sitemaps from the Crawl menu list. Enter a URL path into the textbox that appears in the Submit dialog to lead Google to the location of your sitemap. Refresh your browser to see your new sitemap in the sitemaps list. Click on your new sitemap in the list of sitemaps on the Sitemaps page to open the Sitemaps Details page and investigate any current errors or potential warnings Google encountered reaching your sitemap or the URLs included in it. If you intend to work with GSC, you should follow Google’s advice and read Using Search Console with your website. If you have someone else (such as us) handling GSC for you, then you only need to read this if you’re curious. These are just the first steps after adding your site to Google Search Console. There’s a lot more you can (and should) do with GSC! Contact us if you need help with GSC or other SEO-related aspects of your WordPress site. thanks dude it’s very helpful article !! Thank you for the awesome article ! Please can anyone tell me it can revert? and what is the benefit if we will add the website as per webmaster tool message? cheryl, I’m afraid I don’t understand your question. Could you please try asking again?